Using a rolling pin, roll dough to a 30cm square. For the egg wash, in a small bowl whisk together egg yolk and 15ml water; brush surface of dough with half of the egg wash.
Sprinkle half of the dough with Balderson® Medium Cheddar and dry mustard. Fold over the other half of dough to cover cheese; seal edges well. Roll out cheese-filled dough to a 38cm x 18cm rectangle. Brush top with remaining egg wash and sprinkle with sesame seeds. Using a pizza cutter or small sharp knife, cut dough into thin 18cm long strips. Twist each strip into a spiral shape and place on baking sheets. 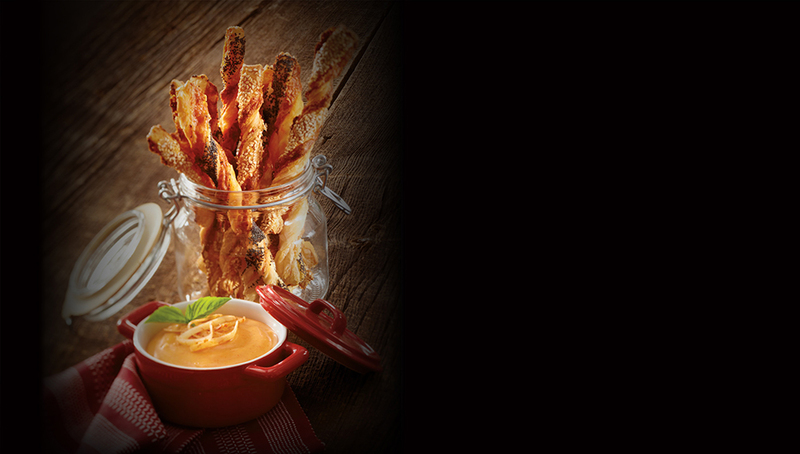 Recipe note: Balderson® Double Smoked Cheddar Fondue makes a perfect dip for these cheese twists.